Welcome back to our blog! In part one, we began exploring the different uses for custom made yard signs. There are so many benefits to using these affordable, versatile signs, as they can drive traffic to your business, event, sale, and more! The summer season is nearly upon us, which means businesses and organizations with be hosting fun outdoor events, while those in the real estate industry will begin listing more houses for sale. Additionally, this is an election year so local politicians will increase their campaigns for the elections that will take place later this year. But what do all of these events have to do with signs? 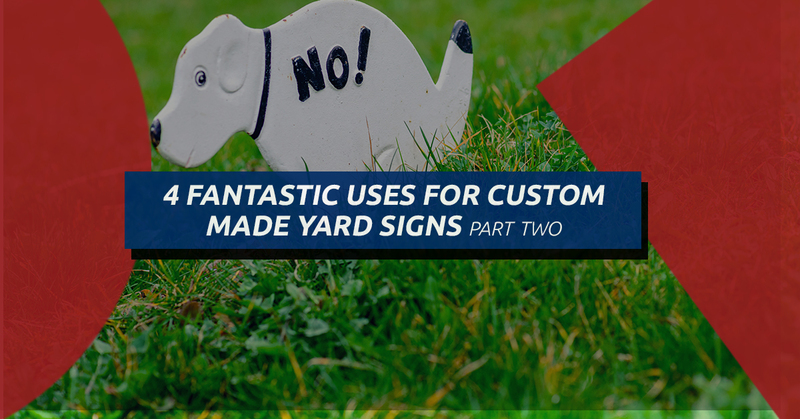 In part two, we will look at three more excellent uses for custom yard signs! If you’re ready to start a sign project, call Sign Central, the Top Rated Local® Arlington signage company. Read on to learn more! If you will be hosting an outdoor event this summer for your business, charity, or organization, custom made yard signs are an affordable way to advertise. What’s more, these yard signs also function as wayfinding signs that not only showcase your event but direct people to finding your event. Whether you’ll be hosting an outdoor music festival, a charity golf tournament, or a fundraising event for your church, a custom yard sign is a powerful way to market your event. While the real estate industry functions year-round, summertime is a peak time for people to buy and sell homes. Real estate agents can use yard signs as site signs to declare that a property is for sale, to promote an open house, and they can use multiple yard signs to direct potential buyers to the property. Many of these custom signs can be reused time and again, which makes them extremely cost-effective. What’s more, yard signs are easy to transport in multiples, put up, take down, and store. Many yards play host to political yard signs during an election year. Not only is posting a political sign in your yard the perfect way to draw attention to the politician you support, but they function as an affordable and influential advertising tool for politicians to market themselves. As such, political yard signs can be custom designed and duplicated several times over to reach as many residential and commercial yards as possible. Showcase your event, sale, or political campaign using custom made yard signs that can draw attention, direct traffic, and influence potential voters. If you’re interested in starting a sign project, call Sign Central today! Our Arlington signage company will create eye-catching sign designs to meet your specific needs, so contact us today!